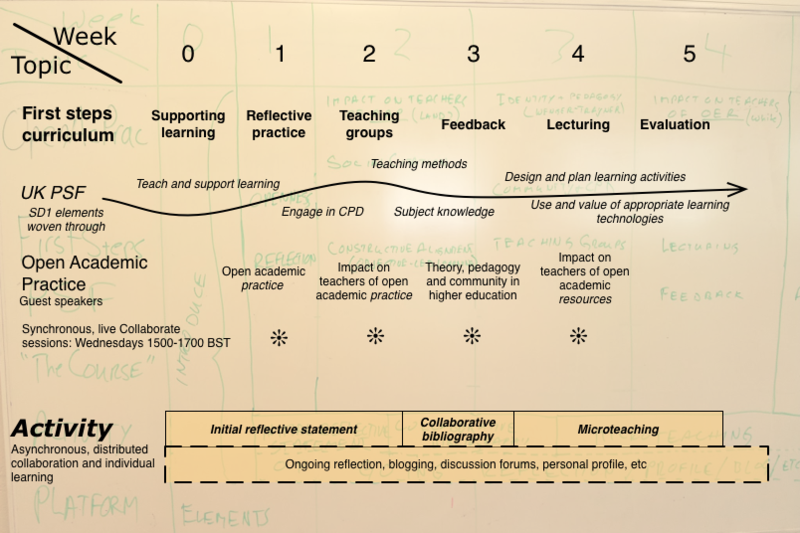 Tomorrow we have our first Review Meeting – we being the team – about the FSLT12 MOOC experience. There is every intention to run the MOOC again next year. I think the intention is to offer it for credit. I may not be involved next year – but whether or not this is the case it is worth thinking about lessons learned from this first offering of #fslt12. I thought it would be useful to make a note of these lessons that I have learned before tomorrow’s meeting, i.e. before being influenced by the others. Overall, my perception is that the MOOC was a success, although I haven’t seen any of the evaluations yet. Feedback in blogs and in Blackboard Collaborate has been positive – but of course this is only the feedback from those who participated, not from the many who didn’t. It is almost impossible to reach the people who registered but then didn’t visibly interact. We don’t know whether they were ‘lurking’ or simply not there. And if not there, why did they sign up and then not engage? For me it has been a wonderful opportunity to be ‘on the other side of the fence’ – so to speak, i.e. working with Oxford Brookes to convene the MOOC, rather than be a participant. I have been a participant in five other MOOCs before this one. What have I learned from working in this one as a convener? – First – it is a lot of hard work – so hats off to Stephen Downes, George Siemens and Dave Cormier who started all this off. I hadn’t realized that despite the ‘hands off’ approach that they appear to adopt, quite how much hard work goes on behind the scenes. I would imagine that this was particularly so for CCK08 and that is maybe why they changed the format slightly for subsequent MOOCs. – Having a good handle on the technology is absolutely essential. In a recent Slideshare presentation Stephen wrote that his law of MOOCs is that if connectivity is not distributed then it is not a MOOC . But this requires a degree of technical expertise that cannot be taken for granted. Fortunately for us we had three wonderful technologists – Joe Rosa, who sorted out the Moodle site for us, Sylvia Currie who not only ‘lent us’ her Blackboard Collaborate site, but also managed it all for us and Liz Lovegrove, who uploaded presentations, videos and resources to our Moodle site. And of course George created the WordPress site. So we did encourage distribution of connectivity across different technologies – and in that sense, according to Stephen, we were a MOOC. – but we were not a ‘massive’ MOOC and for me this gave it all more of an ‘open course’ feel. Ultimately, after the initial surge of interest, we had the assessed participants and a few non-assessed participants fully interacting in the forums and Blackboard Collaborate. How many others were ‘watching’, I don’t know, but maybe there are some analytics there somewhere that George and Joe have seen. But what I learned from this is that it doesn’t have to be ‘massive’ to ensure diversity. We had a wonderfully diverse mix of learners from experienced to novice, across very diverse disciplines. My perception was that this was an excellent opportunity for novices to learn from experts and for experts to have their eyes opened by the novices. This for me was the most rewarding aspect of the MOOC. – I was reminded once again that online, those who are committed to learning put in more than 100% of effort and therefore breadth and depth issues need to be balanced very carefully. In Week 5 Greg Benfield provided some excellent resources on evaluation, but these were not discussed because both assessed and non-assessed participants who were still with us were completely focused on the microteaching activity. On reflection this is no more than you would expect. – And I was reminded once again about how hard it is to get assessment right, so that feedback is constructive and leads to further learning. The type of assessment that we were offering was through personalized feedback. This involves developing a relationship with the ‘to be assessed’ participant. For ‘massive’ MOOCs, this simply does not scale up – so there is a lot to learn about how much learners can learn from the Stanford type of MOOC and ‘mechanised’ feedback, as opposed to the one-to-one type of feedback we offered. Which offers the best learning experience? This would be worthy of a research paper I think. – And finally I experienced the troubling thoughts of whether I should be a ‘traditional teacher’ in this MOOC, or whether MOOCs require a different type of interaction. I alluded to this in my last post. What I like about MOOCs as a participant is that I don’t have anyone ‘watching over me’. I can do my own thing. But as a MOOC convener I’m not sure how far my ‘watching over’ responsibility should extend. I have been a teacher (in the traditional sense) my whole working life and I now feel a dilemma between being responsible for the learners I work with and the autonomy that MOOCs promote. I haven’t sorted this out in my own head yet – but I do know that I have played a ‘teacher’ role in this MOOC – which suggests to me that it hasn’t quite fitted with what I perceive a MOOC to be. – Finally I learned a lot about working in Blackboard Collaborate – mainly due to Sylvia Currie’s openness in sharing her expertise, but also because I have never before had the opportunity to be a Moderator for so many sessions in a row. This was very valuable and I will probably write another blog post about what I learned in relation to this. I’m looking forward to our review meeting tomorrow to hear what others think. Great stuff Jenny, as you know, the MOOC was a very positive experience for me. I look forward to hearing about the review.